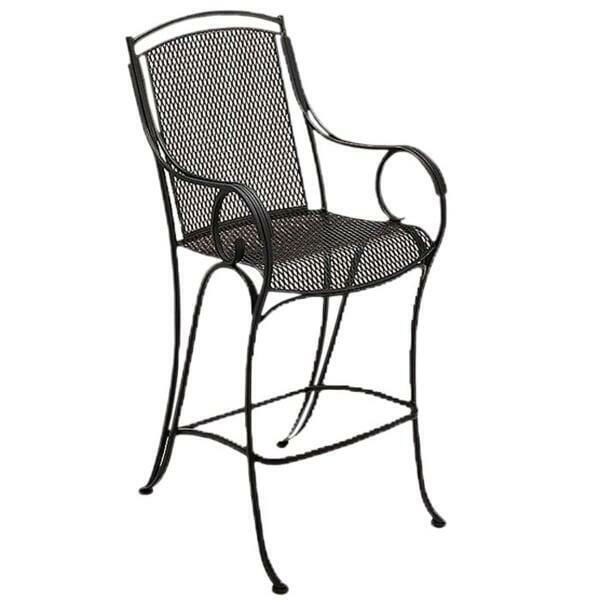 An outdoor bar stool featuring ageless wrought iron, the Modesto Stationary Bar Stool was inspired by the wrought iron patio furniture found in English gardens and on American porches since the 1800s. Note the artistic quality of the frames, which are shaped and formed by hand; Woodard craftsmen follow construction with an innovative finishing process that includes multiple layers of ionized rust protectors, color and a sealer to lock out damaging elements while keeping the color from fading. This creates bar stools that will resist rust, typically the one negative issue with traditional wrought iron. And this allows you to place this bar stool, or a set of these bar stools, outside without anxiety the rain, snow or sleet will cause damage. W 21.5" x D 26.2" x H 48.7" LBS 35 SEAT HEIGHT 30"